Whether in a tech-savvy metropolis or a city where the town square is still the communication hub, local news matters deeply to the lives of residents. Across three disparate metro areas in the U.S., nearly nine-in-ten residents follow local news closely—and about half do so very closely, according to a new, in-depth Pew Research Center study, conducted in association with the John S. and James L. Knight Foundation. About two-thirds of the residents in each city discuss local news in person a few times a week or more. During a period of tremendous technological change—change that is far from complete—this study takes a microscope to the information streams in three news environments across the United States: Denver, Colorado—a highly educated urban area of more than 2 million with internet adoption above the national average and a large Hispanic population (19%); Macon, Georgia—a metro area of 175,000 with a substantial share of black residents (41%), an unemployment rate above the national average, and a local university working to serve as a hub for journalism innovation; and Sioux City, Iowa—a city that spans three states and has a predominantly white population of just 125,000. These cities are not meant to be extrapolated to the United States as a whole, but rather serve as a set of case studies on the ebb and flow of daily local news that speak to the diversity of modern American cities. Studying the ways that local news flows in a city’s population requires more than one tool in the social scientist’s tool kit. For this particular project, the Center employed multiple types of quantitative research in each metro area, including a landscape audit cataloging the full range of news providers operating in the area; a content analysis of the actual news output produced over a week’s time; a public opinion survey of residents focusing on their local news habits and civic engagement; and an experimental examination of Facebook and Twitter posts in each area. Perhaps the most obvious way that local news climates differ across U.S. cities is in terms of volume and choice, the former of which may well have an impact on the latter. Denver’s 140+ identified news providers—including 25 digital-only outlets—is about 2.5 times that of Macon (24) and Sioux City (31) combined. And that seems to have some impact on the dominance of legacy providers in each city. In choice-rich Denver, somewhat fewer residents often rely on local TV for news (58%, compared with 66% in Macon and 68% in Sioux City), though local TV still attracts a greater share of the audience than any other type of news source. More striking, only a quarter (23%) of Denver residents often get local news from their main daily paper, compared with 40% of Sioux City residents and 36% of Macon residents. This is evidenced further in the sources residents say they turn to most for various local news topics. In Sioux City, the newspaper ranks first in six different topics, while in Denver the same is true of just a single topic area–development issues. Nonetheless, the reliance on nontraditional news outlets is still the exception rather than the norm. In all three cities, the portion of residents who often get local news from neighborhood associations, government agencies or officials, or digital-only outlets is in the single digits. The study also suggests that some populations are more engaged with their local news stream, and that this holds across a broader range of topics. Macon residents, for example, stand out for closely following most topics at higher rates than Denver or Sioux City residents. Nine out of 12 topics covered—from weather to education to the local economy—are closely followed by at least 20% of Macon residents, while that is true of just six topics in Denver and five in Sioux City. This higher rate of interest from Macon residents exists in civic-oriented topics such as education and government as well as local crime. But civic issues resonate everywhere. At least four-in-ten residents in each city say they often discuss local government and politics or the local economy. Across these three cities, the study picks up traces of the start of direct participation in the news process, and at fairly equal levels. No more than 10% in each city have submitted their own local content to a news provider in the past year; about 10% have called in to a local radio or TV show; roughly two-in-ten have commented on a local news blog. But it is in the small metro area of Sioux City where residents are most likely to have spoken with or been interviewed by a local journalist (29%, compared with 23% in Macon and 16% in Denver). The case studies also find that digital technology has impacted news habits in all three cities, but at different levels. More than half of residents in Sioux City and two-thirds in Macon and Denver access at least one local news provider digitally: 68% of Denver residents, 66% in Macon and 56% in Sioux City. But, residents of Denver, with their heightened broadband adoption (70% have it in their home, compared with 48% in Macon and 52% in Sioux City) are most likely say the internet is very important in keeping up with local news (45% compared with 38% in Macon and 33% in Sioux city), the most likely to use at least one digital device for news (79% versus about two-thirds in Macon and Sioux City) and to have shared a news story digitally in the past year (54%, compared with 36% in Macon and 40% in Sioux City), suggesting that in more wired cities news may literally travel faster. Nevertheless, while roughly equal percentages in each city—about a quarter of the population—say they get some local news through online social networks, it is Macon residents who are most likely to access at least one local provider through a social networking site. Sioux City residents, meanwhile, show the least reliance on a digital news stream: 22% of Sioux City residents often get local news on a desktop or laptop compared with 37% in Denver and 27% in Macon. Digital differences also stand out among the news providers in each city. Only six of the 24 news providers in Macon and seven of the 31 identified in Sioux City offered daily digital content. Among just the digital only outlets in Denver, there were more offering daily content – 11 of the 25. Denver news providers also demonstrate a greater use of digital opportunities. In five days of content studied in each city, 31% of online news stories in Denver (excluding traffic, weather and sports) contained at least one embedded link compared with 3% of online stories in Macon and 1% in Sioux City. One of the greatest disparities occurs not across metro areas, but within them: that of race and ethnicity. Both Hispanics in Denver and blacks in Macon closely follow local and neighborhood news at higher rates than their white counterparts. In Denver, 60% of Hispanics compared with 43% of whites closely follow news about the local area. In Macon that is true of 70% of blacks compared with 43% of whites. Each of these groups is also at least twice as likely as whites in their respective city to feel they can have a big impact on the city (42% of Hispanics in Denver compared with 21% of whites; in Macon, 36% of blacks vs. 14% of whites). Denver and Macon differ in at least one major way when it comes to news sources targeted toward these populations: Researchers identified nine outlets in Denver aimed at Hispanics and/or Spanish speakers. In Macon, researchers found just one that appeared to cater directly to the black community. Local TV is the single most visible presence in the news space, though a majority of stories produced are short anchor reads that require little reporting. Denver alone offers nine different local TV stations, including two Spanish-language outlets. Combined, they produce more than 25 hours of news each weekday – and at this point, on-air programming is far more of a draw than TV websites. The study of five days of content in each city finds that routine traffic, weather and sports segments accounted for about a third of the airtime. In the remaining programming, anchor “voice-overs”— the short items an anchor tends to read from a teleprompter—accounted for 71% of story segments in Sioux City, 62% in Macon and 55% in Denver. The reliance on anchor reads plays out in the length of stories, though the averages here did vary by city. Nearly half, 45% of non-sports, weather and traffic stories on Denver stations were 30 seconds or shorter, compared with 29% in Sioux City and 17% in Macon. Fewer than two-in-ten stories in each city were more than two minutes long. The role of the main daily newspaper varies from city to city, but in each the emphasis is on more civically oriented and press-initiated coverage than found in local TV. In a five-day snapshot of coverage, 30% of Denver Post stories focused on government, politics, economics or education (excluding traffic, weather and sports stories), as opposed to 11% devoted to those topics on local TV. In Sioux City, the daily devoted 30% of its stories to these topics, versus 14% on local TV. In Macon, the differences between the two were smaller, 26% in The Telegraph and 21% among the local TV stations. But in all three, the level of press-initiated reporting was twice that of the local TV stations as whole: 17% compared with 6% in Macon, 14% to 7% in Sioux City and 12% to 4% in Denver. This does not always equate to investigative or civic-oriented reporting, but it does speak to a less reactive approach to the news it covers. One distinct element of Denver’s news ecology is the breadth of coverage offered by its wider mix of new and alternative news providers. This is particularly true when it comes to longer term, more issue-based news items such as the lead story during the week studied—the upcoming Colorado primaries. Fully 21 different news outlets covered that story in the five days studied. This included the online nonprofit Colorado Independent, which produced six pieces on the election in the time period studied, and Asian Avenue Magazine, whose June issue devoted four stories to the topic, three of them geared toward the Asian-American community. Denver also displays the greatest difference in the coverage offered by three daily papers compared with the mix of their respective local TV stations. Four of the five stories that got the most attention from TV and newspapers in the five days studied were different. In all three cities, some local entities outside of journalism, particularly within government, are using the Web in part to serve as news providers. In Macon, the county government streams official proceedings online, and the Facebook page of U.S. Rep. Austin Scott, a Georgia Republican, ranks among the most-liked and most-commented on over a two-week period. In Sioux City, a local congresswoman had more comments on her Facebook page than any of the news organizations studied. And in Denver, six of the 10 websites featuring access to data sets were those operated by local municipalities, such as Jefferson County’s financial data search tool. Citizens are a part of the news process but mainly as quoted sources or as disseminators of news in social media. In all three cities, citizens were the most commonly cited source in news stories studied over a five-day period (excluding traffic, weather and sports): 20% of the Denver stories, 13% of Sioux City stories and 18% of Macon stories contained at least one citizen source. But no more than 1% of stories studied in any city had citizen bylines. In social media, an analysis of two weeks of content from the Facebook pages of local news providers reveals that users comment on only a minority of posts (32% in Macon, 31% in Sioux City and 43% in Denver). And comments to any one story tend to peter out within 24 hours. Civically engaged residents are more connected with their local news and are drawn to a more diverse set of news sources than are residents who are less civically engaged. In each city, roughly a quarter of residents took part in at least four civic and community activities in the past year. These civically engaged residents follow local news topics at higher rates than the less civically engaged. In Macon, the very engaged follow 11 of the 12 topics asked about at higher rates; the same is true of eight of the topics in Sioux City, and seven in Denver. Additionally, while local TV is a prominent source of news across all levels of engagement, the daily newspaper and conversations with other local residents are more common sources of news for the very engaged. In Macon, for example, 52% of the very engaged often get news from The Telegraph, compared with 33% of the somewhat engaged and 26% of the unengaged. Taken together, the data illustrate that when it comes to news ecologies, the greater digital orientation and array of providers in Denver widen the local news system somewhat with less reliance on the major legacy providers, especially the local newspaper, and a greater mix of coverage more often driven by enterprising work from journalists. The portion of the population finding that enterprising work, though, remains small. Overall interest in local news, meanwhile, is highest in the city with the most limited number of offerings and the lowest level of education and household income. And the greatest level of satisfaction with the role of the news media is expressed in the city with the least diverse population and the greatest connection to those local journalists. Again, these three cities are not meant to be extrapolated to the nation as whole, but they do indicate the degree to which local factors—from digital infrastructure to economics to civic engagement to race, ethnicity and education—contribute to the mix of providers that emerge, the public that supports them and the ways they interact. The full study consisted of six separate analyses, each with its own methodology. In an Audit of the News Landscapes, researchers took several steps to identify the broadest possible universe of local news providers in each of the three cities—including mainstream legacy media, neighborhood and community newspapers, ethnic and alternative media outlets, civic organizations, nonprofits and municipal institutions. Analysts consulted existing lists and databases of news outlets, conducted multipronged web searches with standardized search terms, and contacted experts familiar with the metro areas. Outlets that were primarily listings of entertainment events or sports scores, public relations vehicles, advocacy organizations, local businesses or news aggregators were excluded from the audit. A total of 198 news providers were identified. Of those, 170 were included in a website audit to identify key digital features such as frequency of updates or volume of original content on the home page. The majority of audits were conducted in July of 2014, with follow-up audits conducted in September and December 2014-February 2015. The Survey of City Residents, conducted between July 8 and August 18, 2014, used an address-based sampling method. Residents in each of the three cities were mailed paper and pencil questionnaires asking primarily about their attitudes of and consumption of local news in their city. A total of 1,043 Denver residents, 1,387 Macon residents and 1,191 Sioux City residents, all adults, completed and mailed back the survey. The Analysis of News Content collected and analyzed news coverage from each city over a five-day period, Monday through Friday. The specific dates for each city were Macon, June 9-13; Denver, June 16-20; and Sioux City, June 23-27. All providers identified as producing at least weekly content were analyzed. That amounted to a total of 81 providers: 52 from Denver, 17 from Sioux City and 12 from Macon. In all, 6,416 stories were captured and coded. Site Visits and Interviews were conducted in each of the three metropolitan areas to supplement the other quantitative data sets. Visits to the cities were made in September 2014. Direct interviews (in-person and by phone) were conducted with a range of individuals in each community, representing local government, civic life, business, academia and journalism. A total of 18 interviews were conducted between June and October of 2014. Exploratory Analyses of Facebook and Twitter Posts involved several steps. First, researchers examined the Facebook pages and tweets of all the news outlets, public figures, government departments, and civic groups identified in the landscape audit of each city. Second, public Facebook pages and Twitter users connected to the first list were identified. All of the tweets and Facebook pages were then pulled for each entity in the list. The Twitter data were pulled for a five-day period for each city (Denver, June 16-20, 2014; Macon, June 9-13, 2014; and Sioux City, June 23-27, 2014). The Facebook pages were pulled over a slightly longer time period for each city (Denver, June 11-25, 2014; Macon, June 4-18, 2014; and Sioux City, June 18-July 2, 2014). Several rounds of analysis were then conducted on each data set to understand the flow of content. 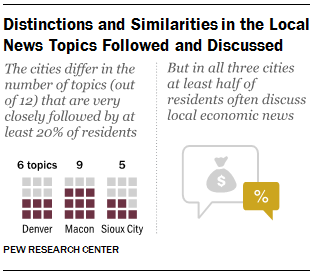 The City Selection—This report analyzed the local news environment in three cities: Denver, Colorado; Macon, Georgia; and Sioux City, Iowa. The cities were selected from 210 DMA (designated market area) as defined by Nielsen, with an aim of studying one from each third of the list according to size (rankings 1-70, 71-140 and 141-210).1 Denver falls in the top third (ranked 17th), Macon is in the middle third (120th) and Sioux City is part of smallest third of markets (147th) on the 2013 Nielsen DMA list. In settling on these three cities, researchers examined a wide range of variables including population size, demographics, broadband penetration (by county), the presence of news providers and geography. As noted, these cities are not meant to be representative of the United States as a whole, but rather serve as detailed case studies of local news in three specific, unique areas in the U.S.